In 1979, just after Iran experienced an Islamic revolution and when fundamentalist Islam was still a new and alien phenomenon, the distinguished writer V. S. Naipaul set off for an extensive tour of four Muslim countries. His reports from Iran, Pakistan, Malaysia, and Indonesia had a quirky but brilliant quality. In each of his destinations, Naipaul found a surprising contradiction: those intent on rejecting the West in the name of Islam are also adamant about gaining the fruits of the West's achievements. For example, he cited an Iranian leader who condemned American culture even as he depended on a steady supply of U.S.-made fighter aircraft. In a profound insight that has stood well over time, he found that despite their insistence on returning to old ways, fundamentalists are in fact deeply modern individuals. They seek not so much to avoid modernity but to recast it in an Islamic mold. Nearly two decades later, Naipaul recently retraced his steps and visited the same four countries, sometimes even visiting the same individuals he'd talked to a generation earlier. His quick vignettes, word sketches, and pieces of conversation make Beyond Belief a pleasure to read. Better yet, this return trip offers an unusual opportunity to assess the progress of political Islam. How have the expectations and fears of 1979 turned out? What has happened to the central paradox of 1979? Naipaul again proves an idiosyncratic though mostly reliable guide to the complexities of Islam and Beyond Belief reflects an impressive erudition. Still, the complexity of his subject sometimes leads to mistakes, even howlers. 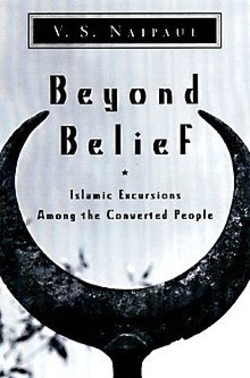 The book's subtitle, explained in the text by the fact that "Everyone not an Arab who is a Muslim is a convert," wrongly implies that Arabs did not convert. Almost as wrong-headed is the notion that every Muslim becomes, "whether he likes it or not, a part of the Arab story." He thinks Friday is the "Muslim sabbath" (it is a day of prayer but not one of rest). He gets Islamic terminology wrong. But Beyond Belief survives such mistakes, for it stands as a travel record, not a piece of scholarship. Indeed, it contains a minimum of structure or the drawing of conclusions. To an unusual degree, the author makes his reader do the work to make sense of his experiences. The effort pays off, for Naipaul is an observant traveler and one learns much from him. His travels this time dwell less on internal contradictions and more on the widespread feeling that things have gone amiss. In Iran, the country of most direct interest to Americans, Naipaul finds that the revolution of 1978-79 has run its course and is virtually defunct. While this observation confirms what many others have noted, he does so in a fresh and convincing manner. Regulations, Naipaul finds again and again, are everywhere, "deforming people's lives." They have taken the place of spontaneity. Where passions once reigned, "the signs and exhortations of authority" now prevail. Where hopes once carried the poor and the oppressed, disappointment now weighs them down. Naipaul finds that the government's heavy-handed use of religion has turned many Muslims against their religion. Hypocrisy has become rank: Men grow beards for job applications, to enhance their religiosity, then but them off. "The word religious rankled with Mehrdad," he notes of a typical young man, a believer in God but a rebel against the many rules His earthly representatives impose. He rejects their "old-fashioned tormenting of women and with the helicopters in the sky looking for satellite dishes." Things have gotten so bad, a most revealing conspiracy theory is making the rounds-that Khomeini was a British agent and "the establishing of the Islamic state in Iran was an anti-Islamic plot by the Powers, to teach Muslims a lesson, and especially to punish the people of Iran." We even hear an Iranian praise the Iraq-Iran war, a huge and hideous occurrence, as a blessing in disguise. Why? Because it had the virtue of making his countrymen more "fed up with Islam." "The revolution had bred strange children," Naipaul observes on hearing such remarks. But revolution itself has been discredited. "No one I met spoke of any kind of revolution as a possibility. That idea, so loved by Iranians of an earlier generation, had been spoilt now, as in the old USSR." In other ways too, Naipaul finds Iran to be an Islamic-flavored version of the Soviet Union, for example, in the promulgation of state-sponsored art. Like residents of the Soviet Union in the 1980s, this is a people worn out by their history and their current misery. The country, Naipaul observes, "had been given an almost universal knowledge of pain." And out of this has come not new hope, not new wisdom, but a shattering new nihilism, again reminiscent of the Soviet experiment. As the experience of other totalitarian countries has showed, unless defeated, occupied, and rebuilt by the armed forces of the United States, it takes a long time to get back on course. Naipaul's incisive testimony from Iran suggests that Khomeini's legacy will be a long and unhappy one.